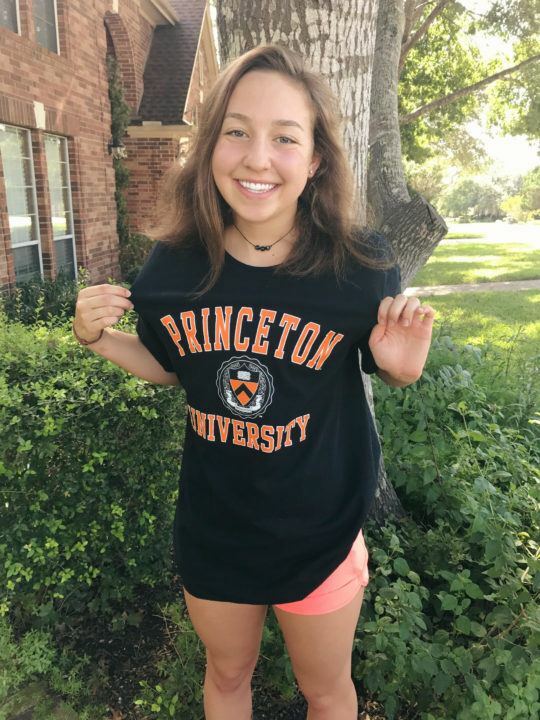 Junior National silver medalist and #20-ranked recruit Regan Barney has rescinded her commitment to the University of Georgia and has instead verbally committed to begin the application process with Princeton. Barney was the first of our top 20 NCAA prospects in the high school class of 2017 off the board, committing to Georgia way back in May. But she’ll no longer become a Bulldog in the SEC, instead opting for Princeton University and the Ivy League. Recruiting in the Ivy League is a bit different, with committed swimmers still required to complete the admission process, which will be Barney’s next steps in the process. Barney was a member of the USA Swimming Junior National Team for the 2015-2016 season and has placed as high as 2nd at Junior Nationals. Barney checked in at #20 on our ranking of the top domestic recruits in her class, mostly on the strength of her 4:10.99 400 IM, which puts her just outside of NCAA scoring range with a year of high school yet to go. Barney is also a rangy freestyler and very good through the 200s of most strokes. She currently competes for Longhorn Aquatics in Texas, but has also swum for Nitro Swimming in the past. Nice to see a student put her education first , although Georgia is a fine school obviously an Ivy League education is something few have the opportunity to obtain , congrats !!! Not always an easy decision: education first or swimming first. Ideally, you can do both. They’ve had some good swimmers. Plus, a Princeton education will be great for her future. Sometimes it’s about the whole person. “Good” academically? If you’re referring to Princeton, I’d like to hear what your “outstanding” is. I went to Columbia 🙂 go lions. Not known for it, but I wouldn’t be surprised if they do an exceptional job developing her.